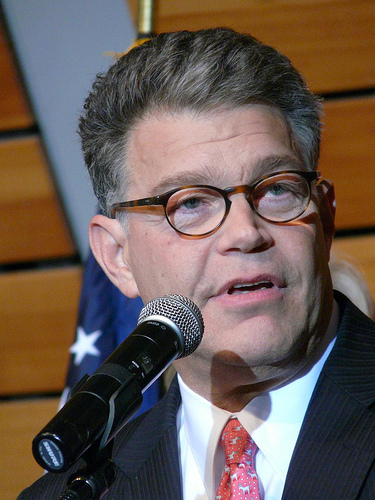 Sen. Al Franken is among eight Democratic Senators asking the Department of Education to make public the names of schools that ask for an exemption to Title IX in order to discriminate against LGBT students and staff. The Column reported on Dec. 1 that dozens of Christian schools had requested the waivers to Title IX. The Senators asked that the names of the school that are granted such waivers be made public. “At a very minimum, we believe that parents, students, and taxpayers have a right to know when institutions of higher education — as recipients of tax dollars — seek and receive exemptions under Title IX as well as the justification of those exemptions,” the letter states. Mr. Franken There is a part of the Constitution of these United States that calls for SEPARATION of CHURCH and STATE. Since when does the US Government give waivers to Bigots for outright discrimination of CIVIL RIGHTS?!?! Where is your respect for the Constitution?? These religious schools are using false information on Transgender people based on information given and published by the Catholic Church. If they can prove their necessity that would be one thing, yet based on mis-information it does not match the medical communities knowledge of Trans information in many countries of today. We now have proof of a physical change in our Brains closer to the Gender we present and not the one Assigned at birth. It is a common Birth Anomaly that happens in five hundred to a thousand births. So why are we tortured by religions Ignorance of our situation, as they do not even live or practice their namesake Christ’s teachings or way of life. I as a Citizen want that separation honoured and respected for it’s being there, and functional for over 200 years, and not paid, even Lip Service as it is today. These protected schools should not receive dollar one, of US Government monies for their Waiver of our Civil Rights. ChloeAlexa a Minnesota voter and Trans advocate. Do have any examples of these requests from the 1980’s and 1990’s? I would be very curious to see how these cases differ from the current ones?